Libouton Martine (Bousval, Belgium) on 9 January 2017 in Landscape & Rural and Portfolio. There is no good war. All the wars are bad. In War, there are only losers . .
J'aime bien la composition de ton cadrage ! Perché il domine et offre en même temps l'étendue de sa vision qu'on imagine fort bien, j'aime beaucoup ce cadrage ! :)))" Peace on earth and good will to all on earth "I love this impressive image ! 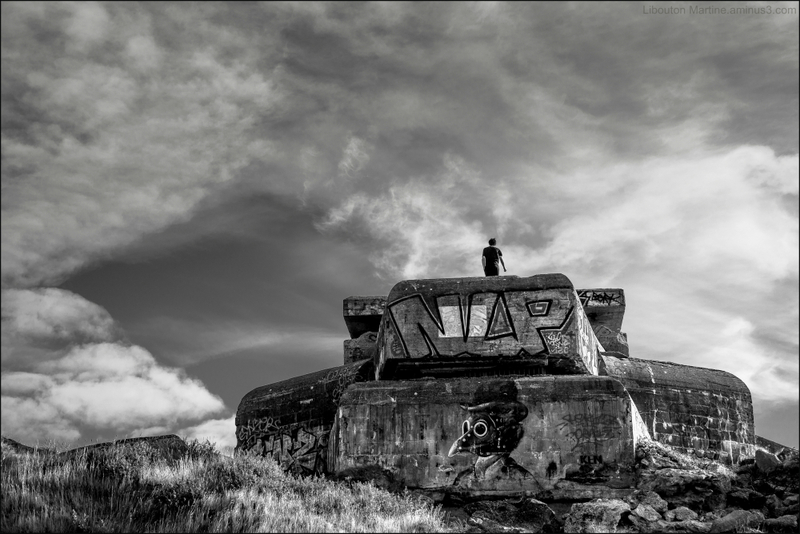 Perhaps decorating these bunkers with graffiti is the best way of dealing with these creepy relics! Excellente image, pour le ciel, le sujet, le cadrage, le message! A great title for a great photo ! Great framing of this wall showcasing the murals. The man helps give a great sense of scale. Je pense que ces excroissance érigées en célébration de la folie Humaine ne devraient pas être laissés au quatre vents . l'image est pleine d'intensité qui va bien au sujet ! Très impressionnant ... le ciel est étonnant et donne à ce beaucoup de drame. Le titre est parfait! Excellent! Une superbe image, impressionnante et dramatique. Impactful words and image. I agree! Impressive black and white photo. No, thank you very much! Excellent b/w photo of the bunker. I agree with your title! Love this isolated wall and artwork. The lone man standing at the top adds so much dramatic character to the scene. I agree with "No War"! Such a great shot of this old bunker and its beautiful artwork. A clever photo-study : different ! Great message in a lovely and very free place . A great sentiment...if only we could achieve it. Amazing monochrome and great point of view/angle.